There doesn't seem to be as much excitement about the NATS as in the past on TAC as a whole, or is it just me not seeing it or is there something to it. They did have 397 birds this year most in awhile. A lot of new faces which is a good thing. Next year their celebrating the "9" year cars, 69, 79, 89, etc. That puts me on the spot to get my tata finished! Definitely not the enthusiasm as was there 5 years ago. It is bittersweet to see a fraction of the "old gang" at the Nats now. TAC used to be well-represented every year. But times change, people move on, life happens. And I've noticed that it is the same with a lot of the other old-school groups. Their attendance is way down too. We are getting older... like our cars. Luckily my '77 made it just over 1000 miles round-trip this year to the Nats. I was watching the "two months away" post thinking it is still two months away... I guess my summer was the same way, it's over and I've done nothing fun. Would love to make it to the event one day myself. After going crazy trying to chase aftermarket parts, it’s easy to let a build go over budget. These days, I’m doing mostly GM parts with a few upgrades here and there. Hopefully sticking to that will allow me to afford finishing my car so I can make it to these types of events. I’m sure many share this same position as myself. Ultimately have to make more money to afford the hobby. Dreamin2, Thanks for the mention. And congratulations to you, too, for your concours gold unrestored award. It doesn't get any better than that! I don't think the excitement for the Nationals has diminished. I think the it looks that way as the medium has changed. All that you see on Facebook now, was here just a few years ago. It is sad to see fewer of the the "old crew" at the Nats, though. But it's exciting to see younger people passionate about these cars. Really sad is that you, George (1sgtretired), Mike (yeti) and myself ARE the old veterans! I have really wanted to attend, but the distance would be a challenge if I wanted to bring a car there. I am seriously considering attending next year because it seems like it is a fantastic event! I will make it a priority next year. Also to get my 79 done and there. I only live an hour or so away too. Really no excuse.. Thanks Jeff, I didn't think about it but your right Mike, you, and myself are the "old heads" representing TAC that was there makes me feel old and congrats to you by the way. Sorry if I missed anyone I didn't see. Jeff I'm also sorry I didn't have more time to talk with you or Mike the weekend just flies by the rain didn't help. I did and always do meet some great folks there and catch up with now old friends. I was glad to see there were some folks outside in the evenings shooting the bull. I remember TAC would have close to 20 plus people in a circle counting spouses. If you haven't been to the NATS or it's been awhile it is our premiere event almost 400 birds in one place and some great guess speakers use to be 500 at the airport years ago. Regardless of the condition of your car or how you feel about the NATS... judging....etc. I have my horror stories this year included. Meeting up with old friends hanging out I still learn a ton about our cars every time I go. I met two brothers from Canada their first time at the NATS whose cars were a bit rough but they were proud as peacocks they drove them there and had a great time. Stayed up with them till midnight Saturday night. More to follow just rung the bell. I didn't make it this year. My dad was just out of the hospital 2 days before the Nats. This has been a tough year for making any car show or events. Next Year again for sure. Hope to bring 2 cars. I think Jeff noted that it also, I think there was fair amount of activity on Facebook this year. 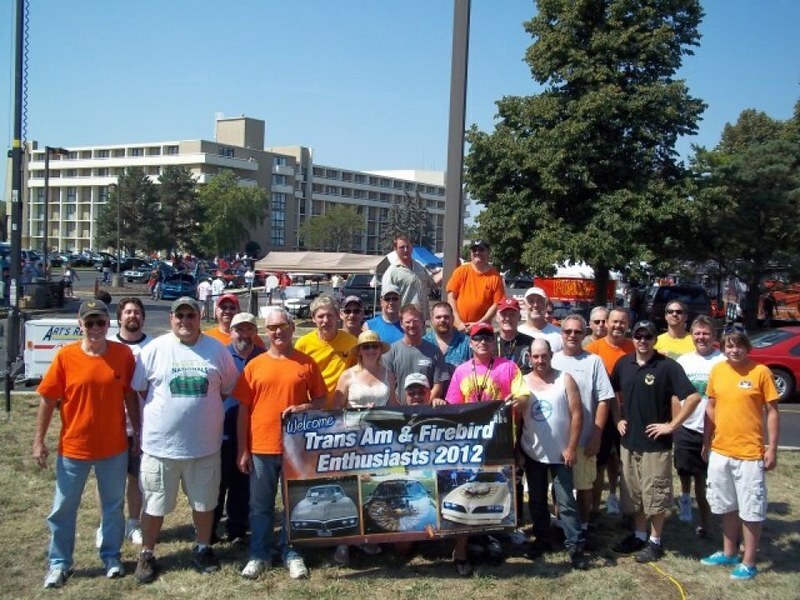 This year for us was the Rubicon trip next year is the Trans Am trip to the Nationals. I’ll be retired living in South Dakota should be a nice drive and we’ll have a 6 speed so the car won’t be so stressed. It was an amazing turnout, most cars I've ever seen on a Friday, the lot was packed. I couldn't figure out why the turnout was so great this year (not that I'm complaining!). Not an anniversary year of the T/A Nats, not an anniversary year of a particular model year like in years past (1967 Firebird, 1969 Trans Am, 1977 Smokey And The Bandit, etc. ), and no special guest speaker that hasn't been there before. The Tipp City Cruise was down, but the weather didn't cooperate on Saturday. 1976-1981 Special Edition cars were depleted, nothing like a couple years ago when there were probably 20 in attendance. The 4th Gens, as always, dominated, but the 1979-1981 model years had a great showing, more than I'd ever seen before. The entire first row, up next to the hotel, were all 1979-1981 models, some even bled over to the next aisle. I have not been able to make the Nats for the last few years due to the 'college move in weekend' conflict. There is a good chance that I may be able to attend the 2019 NATS. Our oldest son has graduated college, found a very good job and has moved away. Our youngest son decided at the last minute to change majors and schools - he is now commuting to a local college versus staying on campus 2.5 hours away. I tried finding a hotel room for this year's show in mid August, but came up empty. So as long as he doesn't change his college plans again, I should be able to attend the 2019 show. Hope it works out for 2019 for you. We miss your car... and you too. We'll be there for sure! This year was just not in the cards because of our 25th anniversary trip, but next year is game on! Awesome! Hope to see y'all there! I don't think it's the Nats, I think it's TAC. The lobby has about 2 active threads now on a typical day. I also noticed the decrease in activity on TAC since coming back on. Hopefully it comes back around. Im trying to do my part LOL. I know home projects and work have been keeping me busy and away from here more than I like. Hope that slows down a bit and I can contribute more.